Whitch stakeholders are importantin which innovation phase? Other: Try to include people who have a good understanding of the social problem and the context in which the solution is to be created. Stakeholders map is a tool for visualizing all stakeholders involved in the social innovation process. This Map will help you list and position identified stakeholders within appropriate innovation phases. That way, you will have a clear view of which roles stakeholders can play in different stages of innovation, what could be their level of commitment and strategic importance. 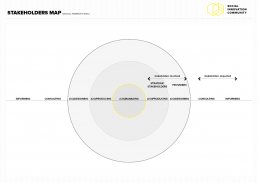 Stakeholders Map is helpful for understanding the complexity of building relationships, realizing which connectors can be crucial for innovation development and why as well as tapping into an unusual suspects area. It is recommended to use this tool occasionally during the innovation process to update it and review accomplished partnerships and their outputs. stakeholders impacted, who only benefit or not from what you do. Within the involved stakeholders area separate ones who are of strategic importance with ones who provide technical support. After listing them, consider their level of participation in the process – going from the outside to the center of the circle their level of interaction with your innovation increases. Think about users! Don’t forget to involve them in different stages of the innovation process as well.